I was pleased at finding a pair of boots at a reasonable price, however was seriously let down by the store staff. They were unhappy, unhelpful and unfriendly and they ruined my experience. I was glad to be out if the store as soon as possible. They didn't greet me and my son when we entered the store either but just Stoddart chatting around the till. As I say I will not be shopping here again as I find the staff really off putting. On the 08/05/17 I bought a pair of ladys black canvas shoes 9.99 I loved them so comfortable two days later insole was lifting up and I wear socks with them so I popped in to the shop I explained to the manager oh I have found a few what as this problem so he changed without my receipt which I thought had left at home which I hadn't felt fine as was leaving shop but as I was walking they kept dropping off my feet went back he wouldn't change them were same size as first ones so oblivious their is a fault with these shoes.My manager has told me to report this to the council he was a boss of Matalan so he knows what he is talking about I have bought shoes & boots many times from shoe zone but won't be any more I am going to Trading Standards next week on my day off I had two days wear from these shoes v ery hurt an d disappointed. My experience was absoultly disgusting, the member of staff had a bad attitude spoke to me like i was stupid, was not helpful and embarrassed me!! I will not be shopping here again. 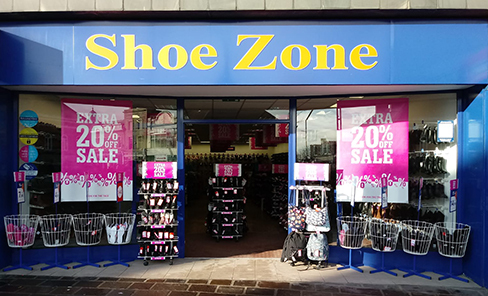 I have used a few shoezone stores and have never had a problem with the shoes or staff but the utter disrespect the sales woman gave me today was terrible then she stood and wanted a full on argument with me! Lovely clean shop pleasant staff.